Buffalo" (NY) and "beauty" do not normally occur in the same sentence. We're talking about a city 'belted' with derelict factories that's been losing population for a generation. It's struggling to demolish thousands of abandoned houses. It's been known to get snowed on for 100 days in a row (I was there -- with a long driveway and no snow-blower). But Buffalo has elements of beauty dear to a few doughty hearts (e.g., my wife's - she's a native). These include Olmsted-designed boulevards radiating from an Olmsted central park (Delaware Park); a number of early twentieth-century architectural icons; lots of big, boxy beautiful Victorian houses that can be had for a relative song; a handful of long, graceful commercial and residential avenues that make a vital urban enclave; a surprisingly vibrant arts community; and prices that make it almost like living in another country. In recent years, too, Buffalo has become a site of the triumph of imagination over physical reality in two ways that have caught my heart. 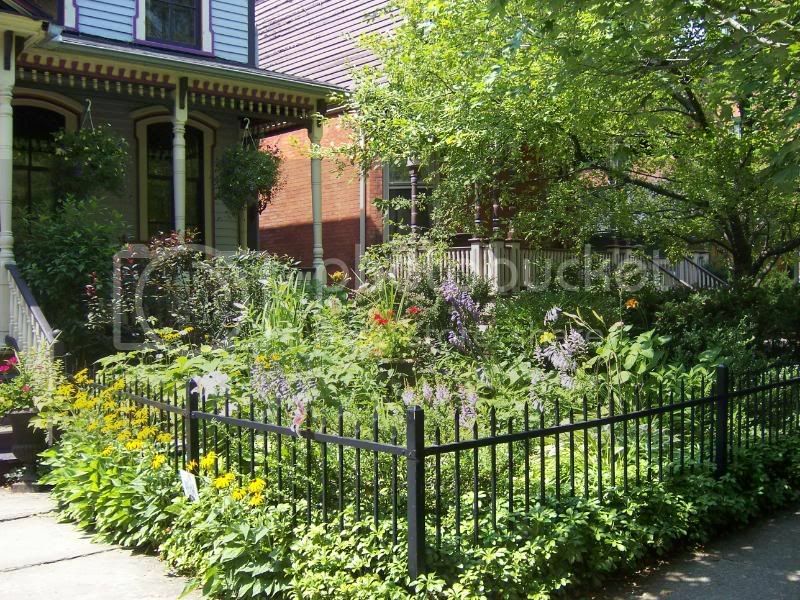 The first is the inkpool spread of neighborhoods that have gone mad with gardening. Really. Gardening, like happiness and obesity, is contagious, and urban pioneers on the West Side have inspired neighbors to garden and so attracted new urban pioneers. Call it clear, grow and build. The movement has been driven in large part by the mind-blowing Buffalo Garden Walk, America's best event of its kind, held the last weekend in July. Unlike in most garden walks, any resident can exhibit -- and over 340 do. There are no admission fees. There are Japanese gardens, English gardens, Russian gardens (i.e., barely controlled wildernesses) and what I would call Buffalo gardens - eclectic, funky mixes in which found objects and exotic-looking surrounding rooftops figure prominently. There's ubiquitous bee balm, which grows like a weed up there. There's a miniaturist intensity to many of the small back-yard enclosures. But Buffalo's also got a fair amount of open space, and some entries are more like small parks. A slideshow is here. The second Buffalo transformation is in the paintings of local artist Peter Fowler, whose richly layered urban fantasias, in his own words, "conjure a parallel world of past and present." To look at his landscapes (which are proliferating as fast in Buffalo living rooms as bee balm in the yards), you'd think Buffalo was Venice, or Shangri-la. You'd want to go to there. And you should!